Awaking one morning out of a drunken stupor, composer Richard Morton can't shake the feeling he has murdered a woman during the night. 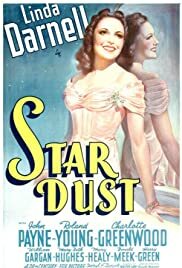 Classic whodunit mystery film about a gold-digging variety show actress who has many enemies and is found dead in her private railroad car at Grand Central Station in New York. This is such a charming film. It concerns young hopefuls who want to get into Hollywood. The lead is played by Linda Darnell, and the script was written based upon what really happened to her only the year before. Both in real life and in this film's story, Linda was discovered by a travelling Hollywood talent scout (in reality she came from Dallas, in the film from the fictitious small town of Rockville, Arkansas). She then went to Hollywood, took a screen test, but was sent back home because she was discovered to be only 15 (but returned anyway). In the film, she is sent back home because she was 16 going on 17, precisely the age she really was when she made this film. I have already had occasion to praise Darnell's brilliant film debut (when she was 15 going on 16) the previous year, in HOTEL FOR WOMAN (1939, see my review). Darnell met with a terrible fate, however. In 1965, aged 41, she was sitting and watching this very film on television when a fire broke out in the house and she died of burns. The young male lead in the film is John Payne, aged 28. Payne was a very fine fellow, as I discovered the only time I met him. He and my mother had known each other in Virginia, though he was a few years older. She and I went to see him backstage at a play, where we had a jolly chat. He came from a wealthy background and had the easy and confident manner of someone who had been born with a silver spoon in his mouth. But he did not choke on the spoon, and instead became an excellent movie actor. I have always thought that he should have been in better films, but he was mostly a star of B pictures. By the time this film was made, he had already appeared in ten films in only four years. In this one he sings as well as acts. He and Darnell are summoned to Hollywood for screen tests at the same time and meet on the train. The other lead actors in the film are Roland Young, who plays the talent scout, and Charlotte Greenwood who plays his colleague. They are both superb, being the old pros that they were. I note that Darnell's biography on IMDb wrongly names her character in this film as Carolyn Ayres, whereas the correct name is Carolyn Sayres. The film was directed by Walter Lang, who is best known for WITH A SONG IN MY HEART (1952, about Jane Froman), CALL ME MADAM (1953), THERE'S NO BUSINESS LIKE SHOW BUSINESS (1954), and THE KING AND I (1956), all of which were smash hits. The 1950s were truly the glory days of Walter Lang, who retired in 1961 after having directed 66 films. Donald Meek plays a supporting role in this film and it is a serious part, unlike his usual whimsical ones. The film is romantic and full of youthful zest and hope. It makes a great change from gloom and doom, of which we have so much these days. One little touch amused me, namely that in order to demonstrate his small-town naivete upon arriving in Hollywood, John Payne pronounces the name of Charles Laughton as 'Charles 'Laffton'. Perhaps that was an in joke, since one thing Charles Laughton in person certainly was not was someone who could be described as a laugh a minute. He could be quite horrid. This film is very much a breath of fresh air, though very much an early forties film with all the manners and mores of those days, which seem so innocent today. How strange to think that only a year after this film was released, the world would be plunged into war and joie de vivre would dry up. This film was thus one of the last gasps of cheerfulness in the cinema before life became grim.